When I first picked up my box, I had to laugh. 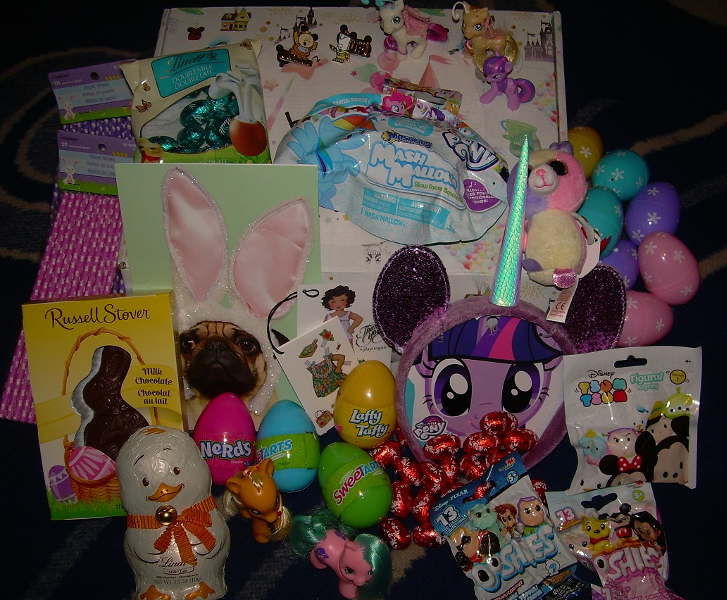 I'm starting to get very familiar with that address... (lol) @Skybreeze sent me an absolutely amazing box full of Easter goodies! First of all, the box itself was delightful. The outer paper was covered in adorable Easter stickers, and then the inside was this cute Disney box! And so crammed full... Skybreeze is a master of cramming stuff into every square inch of a box! 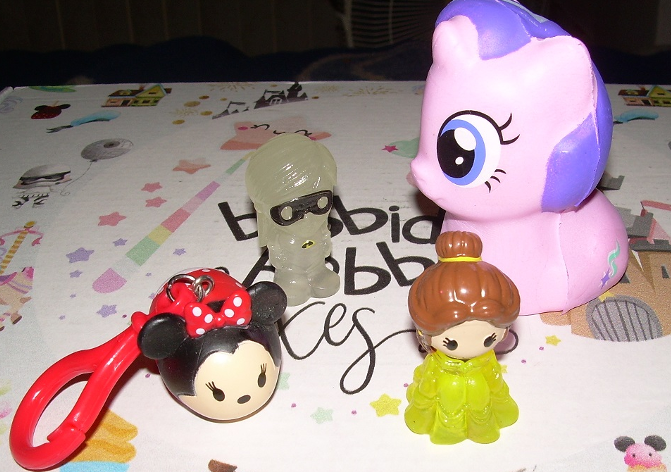 Here's what was in the blind bags.. And a close-up of the G3 Breezies... plus two adorable pins of Cogsworth and Lumiere! And G4 Applejack with the special ribbon hair... and G1 Teeny Tiny baby Tiny Tabby!!! Eeee! I love them! They're all adorable! I am so, SO thrilled with my box. It's amazing! Thank you, Skybreeze... so much! @Uftaki - I am so happy you are happy with all your goodies! Ordering Disney pins is a big responsibility. That stressed me out more than the ponies. Lol!!! Aww... sorry to hear the pins stressed you out! [offers hugs] I'll always enjoy pins. Thanks for everything! My box came across Canada to me from my lovely @Cactusflower. It was adorable decorated with MLP stickers (I kinda wanna keep ‘em). Adorably packaged with the most beautiful Pug card I’ve ever seen. Yes I am going to keep it five-ever. This is what was in my box! So much and so well thought out. Thank you again @Cactusflower! You spoiled me rotten but I am very thankful for it. 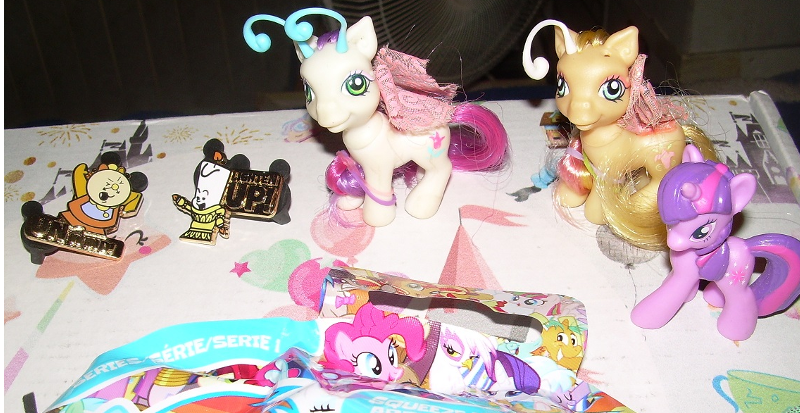 Ps: the bunny erasers are each going to live with all my Fluttershy’s. 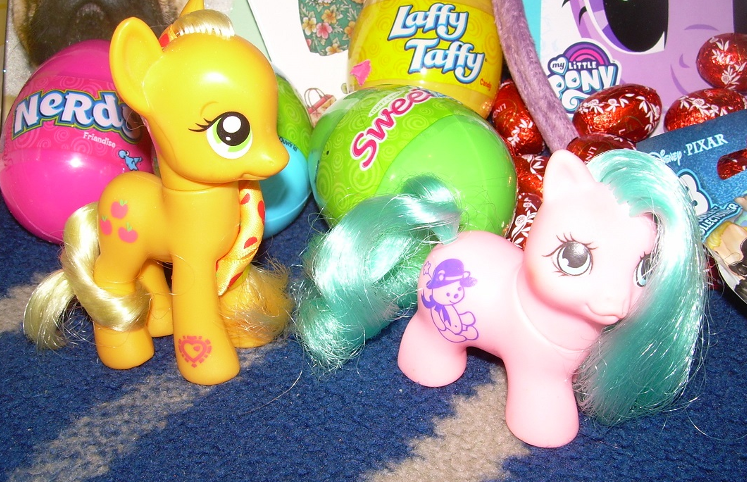 Then these are the amazing and beautiful ponies I got! I was shocked to get Tickles in a swap. I love her so very much!! And I don’t know why but I am insanely in love with little Luna inside a tiny little Easter basket. Thanks for another awesome swap again!! And thank you to @Gingerbread for hosting another amazing swap for all of us. We don’t deserve you.